Camp and PCVs One of the most rewarding project opportunities for a PCV is to bring that once-in-a-lifetime experience to the kids we serve. Working with the open, growing minds of the next generation gives us a chance to positively mentor and encourage the future of our host countries. Best of all, these kids turn around and inspire us right back with their creativity, passion and vision for a better world. Let’s be honest, what could be more fun than teaching host country kids how to roast marshmallows for their very first s’mores? 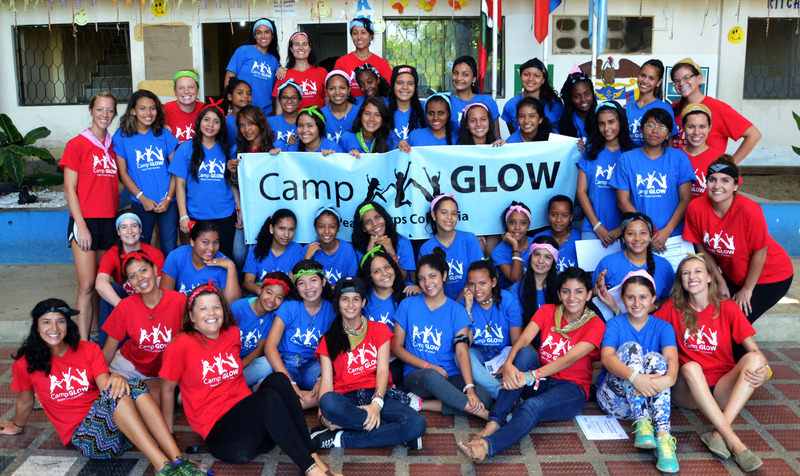 Camp GLOW Colombia’s priorities Camp GLOW is a PCV-led girls empowerment and leadership camp that began in Romania in 1995 and has expanded to many PC countries, arrriving in Colombia last year. Given the prevalence of the machista culture and persistent gender inequality in our country, Camp GLOW in Colombia is tailored to our girls’ challenges. Here in Colombia, despite high literacy rates and a high gender equality rate women continue to have many gender-based challenges. According to Human Rights Watch, 37% of Colombian women have suffered domestic violence, a rate that grows to 48% among women displaced by the conflict. By the age of 19, one in five girls has been or is pregnant. In the workforce, women earn 24% less than men, and only half of working-age women are in the workforce. 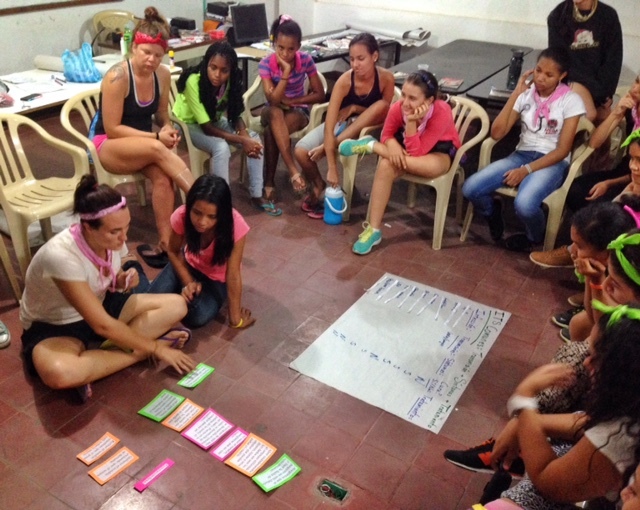 Girls learning about gender and leadership outside the traditional classroom. 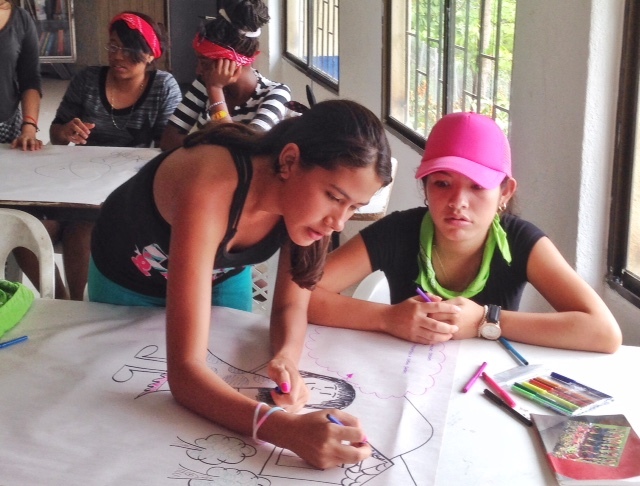 In response to these issues and our experiences in Colombia’s public schools, Camp GLOW Colombia aims to address these issues with workshops on leadership, gender, sexual health, nutrition, professional development, self-esteem and community service. Ultimately, we hope to show these girls their unique strengths and capabilities, both as women and as members of their communities. Planning a girls’ camp So, where do you start with a camp? The answer is: far in advance! For a June camp, my co-directors and I started planning the previous October. Since we were counselors last year, we were able to take last year’s framework and outline our goals for 2015. We chose the theme “Soy Capaz,” (I am capable) based on a recent campaign to connect and empower Colombians in a unified post-war society. My girls from my PC site in Puerto Colombia made me so proud! But despite the logistical problems and long planning sessions, the camp grew and took shape. Like I told the girls in my director’s remarks at the end of camp: A year ago, the campers were just “the girls”, but as we planned they became “the girls of GLOW 2015”, who became “Aseneth and Valentina and Maria Jose,” and finally, the first day of camp, they became our girls, 35 bright, excited faces. And that’s what it’s all about. 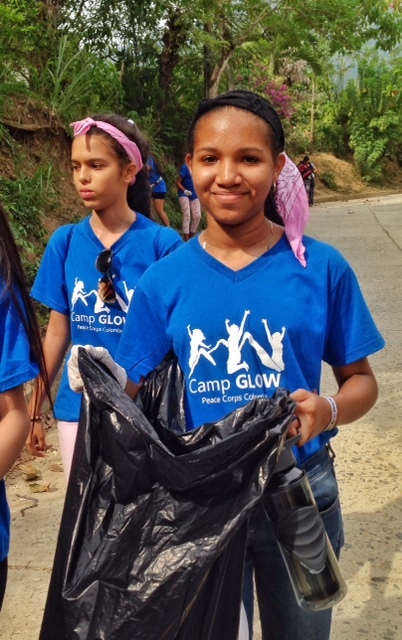 Implementation: Camp GLOW 2015! This year, we extended the camp to five days, traveling to site on Monday afternoon and returning on Friday afternoon. 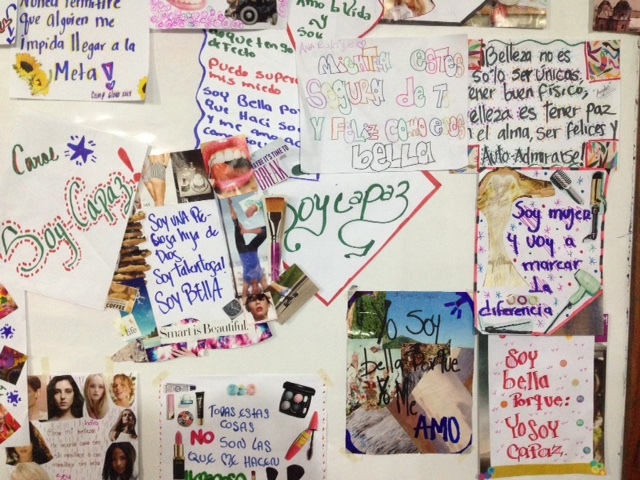 On Monday, the 35 girls, 10 counselors, two junior counselors, three directors and one photographer met at the contracted vans to drive three hours up to Minca, a small mountain town with a PC-affiliated boarding school that opens its doors to us each year. 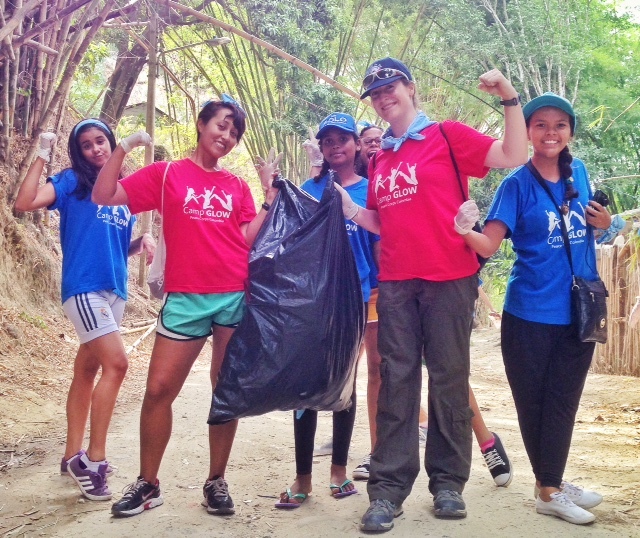 Counselors and campers take a minute for a “strong women” pose during the trash clean up. cleaning duties, workshop rotations and, of course, team competitions! One popular activity was a team relay based on a popular Colombian game show. To keep the girls busy and energized, each morning began with yoga and each day had a heart-pumping activity, such as a sunset hike or all-camp Zumba class. In the evenings, we calmed down and reflected on the day’s highs and lows in each team, taking time to discuss and write in journals. goals and wrote self-esteem mantras to remind themselves of their beauty and worth. Outside the classroom, we explored a coffee farm, swam in a waterfall, tasted s’mores around a campfire, and did a trash clean-up drive through the community of Minca. The last day, six Colombian professional women and one American (my mom!) came to talk about their experiences as a lawyer, international relations specialist, professor, school dean, computer programmer and accountant. They shared their challenges and successes as career girls, mothers, mentors and, ultimately as powerful, strong women. That night, we celebrated our team bonds and that Colombian creativity with a talent show that featured team dance routines, musical numbers and a meaningful skit that showed all the topics of the week. The counselors and directors added their own parody synchronized swimming routine, too, which the girls didn’t quite understand, but we got a kick out of practicing. By Friday, we sent 35 happy, tired and hopefully inspired girls back to their communities, armed with new ideas, new friendships and a new perspective. I can’t wait to see what these girls do with their lives! Impact of Camp GLOW I want to share a few of the specific vignettes of the camp’s impact, because the stories are what make all the work worthwhile, bringing the logistics to life. When we boarded the vans on Monday, one girl confided that she had never ridden in a van before; she lives on a remote, under-served island and had never left the area. On one of the hikes, girls took hundreds of selfies and pictures of flowers and trees, exclaiming that they had never seen these things. You often don’t see the impact of your service or the difference you’ve made until much later (if ever.) But sometimes, if you’re lucky, you see the change for yourself. Camp GLOW, for all its headaches and stressors was fulfilling and ultimately, I think that yes, we made a difference. I feel like we achieved what we set out to do, and with the girls’ enthusiasm and input, I can say that it was a success.